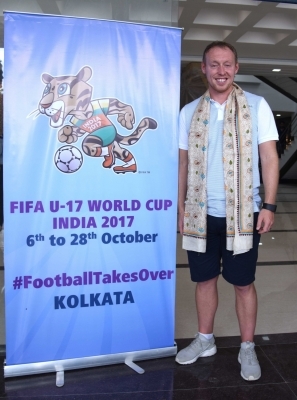 Kolkata, Oct 24 (IANS) England coach Steve Cooper on Tuesday said the four semifinalists team in the FIFA U-17 World Cup have no “massive difference” among them and anyone can lift the trophy. “We just want to play our way. I don’t there is a massive difference among the four teams left,” Cooper told reporters on the eve of the rescheduled match. “I don’t think there is massive difference, tactically, physically and technically. We want to get the right plan and deliver ultimately. We want to create the best environment. I am proud to represent the country in a semifinal of the World Cup and we would stick to the plan,” Cooper said. Besides England and Brazil, Mali and Spain are the two teams left in the competition. Cooper said that his side can match formidable Brazil in almost every aspect of the game. “Brazil are a strong all-round side. They played some great football against Germany after a goal down. They showed a lot of fight and spirit to win the game. It is likewise with us also. I don’t think there is a big difference tactically, physically and technically among the teams,” Copper said. “Tomorrow’s match will be decided by a fine margin and through some defining moments, I’m sure. You go into the semifinal of a World Cup with your strength all over the pitch. We just want to play our way, get the right plan and deliver it ultimately,” he added. Asked about the strength of the Brazil side, the England coach said: “We have a lot of respect for Brazil, for coach Carlos Amadeu. They have some good players. But we are proud to play the semifinals of a World Cup. “We have nothing to fear, we will have to stick to our plan, treat the game as it comes. We will believe ourselves and give our all. It is the biggest game for all of us and a semifinal of a World Cup versus Brazil in a magnificent venue is amazing,” he said. Copper refused to dwell much on targeting a few Brazilian players for special treatment on Wednesday and said he would rather want to focus on strengthening of his side. “We are aware of Brazil’s attacking strengths and they have some very good players like Lincoln or Paulinho. They can make a big difference for Brazil for sure and both can be threats to us. But there are also others (in Brazil team) who can make a difference. “But I don’t think we can focus on any part of opposition. I will say both teams are strong throughout. There are players who can make a difference with the ball. We just have to be prepared for how to win the game and stop Brazil from playing their way,” said Copper. Despite playing four games at the Vivekananda Yuba Bharati Krirangan, Copper said his side will not have any advantage. “We know the crowd support (for Brazil) in the match against Germany. We are playing for the fifth time tomorrow. It was four great experiences here. But we still want the crowd to support us more than the opposition. “It’s an amazing experience to play here but it does not matter how many times you have played in a venue. To be honest, I don’t think of any advantage or disadvantage tomorrow for any team. But we know the journey, what the pitch looks liked and we want to make it a positive experience,” he said. Asked what he felt about the teams having to return here after the match was shifted from Guwahati, Cooper said: “We like it obviously. We planned to come back (if reached the final). I did not think it is this early to return here. I told the boys yesterday that it was a positive development. “There were wonderful times on many occasions here. I was sad to leave Kolkata and really pleased to be back here. “The players need a lot of credit. The journey has not finished, looking forward tomorrow. It’s the best five weeks away from home. This will serve the players well for long term. When they play in the senior World Cup, they will be better placed. It won’t be a brand new experience for them,” he added.